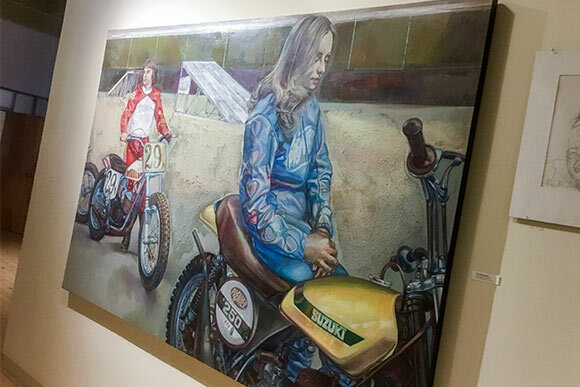 When local businessman Joseph Erdelac commissioned Cleveland artist Shirley Aley Campbell to document motorcycle enthusiasts across the globe more than four decades ago, her lifelong fear of bikes didn't stop her from respecting and superbly depicting the culture. It took years, but when the commission was finally complete, she'd created an extensive — and historic — visual collection of the people who live to ride. 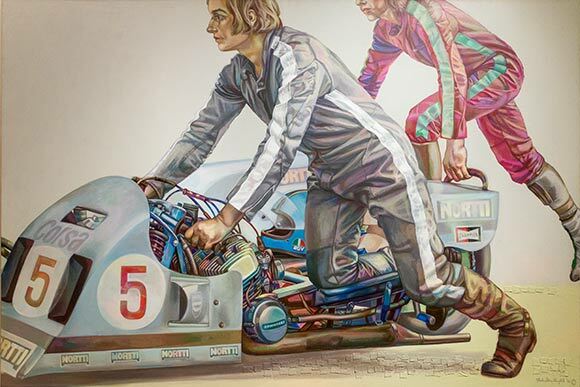 In all, 13 five- by seven-foot acrylic images of different bikers would make up "The Motorcyclists of the Seventies,” from Swedish Grand Prix racers and outlaw biker clubs to pleasure rides and a frantic wartime escape. “He loved art,” recalls Campbell of Erdelac, who owned an AMC dealership on Lorain Road. “That was his passion. He loved automobiles… He had never been on a motorcycle. He said it’s a thing of the future. He thought for certain we would all be driving motorcycles some day. Erdelac’s employees set up the subjects, locations, and associated events, the first of which was in the Flats. It became “The Hillclimb”, and kicked off the series in July 1973. Each painting took one to three months to complete, with her subjects sitting for lengthy periods over multiple days. She worked off the hundreds of sketches she done along with photographs. She composed the images and added details based on the subjects’ personalities and the situations being conveyed. She took into account every detail of the painting. She would also add various materials to provide texture to the pieces. “Sometimes the works are too flat, so texture makes it exciting,” she says, adding that Erdelac was a perfectionist, but she lived up to the task. 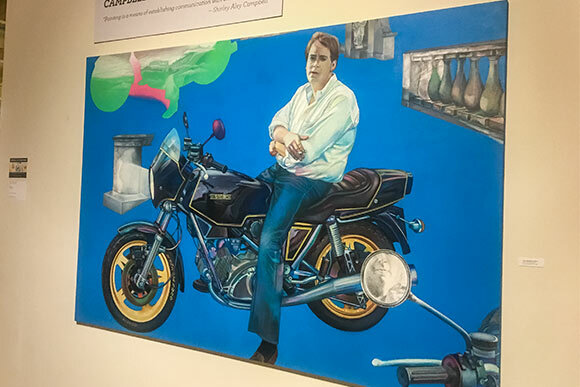 78th Street Studios owner Daniel Bush, who purchased the entire "Motorcycles" series has been a fan of Campbell’s work for years. The series was on display in Gallery 215 at 78th Street Studios earlier this year and will return in its entirety later this summer. Four pieces in the second floor hallway leading to the gallery will remain up in the interim. Unexpected angles, composition, cropping and background colors give each of the paintings an element of surprise. In "Championnat D'Europe," a sidecar racer leans dangerously far over the rigging with a competitor hot on his heels. A group of riders laboriously push their bikes away from the frame in "Imatranajo Sudmen Grand Prix" while a teammate sits calmly on the sideline. Or consider "International Six Day Trial," in which the grittiness of the pit scene is perfectly contrasted against a surreal lemon gray background. 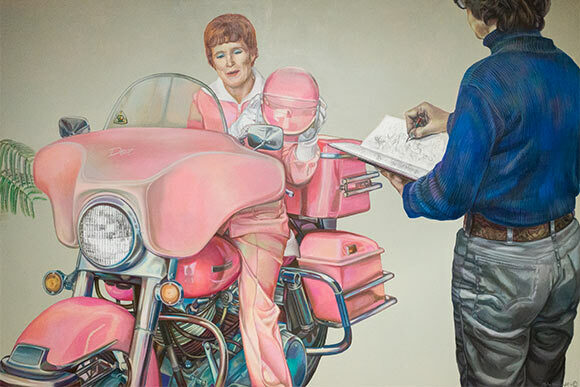 And when Harley-riding Dot Robinson showed up in head-to-toe pink, Campbell painted herself into the frame wearing blue to offset the overpowering color. Campbell says that she had a ball painting the series, noting everyone was incredibly accommodating and nice to her — from a successful business suit-clad Hollywood producer riding with his family in "John Burke" to the Russians featured in "Ice Races," which she had to meet in Holland on account of a Visa snafu. “They couldn’t imagine a woman painting. They’d ask me ‘Why aren’t you with husband at home with children?’” she recalls. “They were racing on ice, and I was underneath looking up at them. I was in the pit, and the ice was falling down on me. Those bikes went fast! I don’t know how they drove those things on ice.” The tire spikes she expertly depicted in the image, however, help to answer that question. Although each person was unique, Campbell says she enjoyed them all. Campbell captured "The Flying Angel" Debbie Lawler, an accomplished motorcycle jumper, who had just suffered a terrible accident prior to her sitting, and was very emotional about being unable to race. She also depicted a Vietnamese family fleeing their homeland with a stark yellow background, although the scene was recreated Stateside. Campbell’s husband helped to prop the motorcycle up so they appeared to be driving. The most difficult piece is perhaps "Abram Drain," a portrait of a man who had seriously injured his legs racing. An image of a fallen bike on the top of the work shows where Campbell watched a man die. The series culminated in January 1981 with “When I Met the Lord, He was Wearing Loafers,” a portrait of Alexander 3rd Lord Hesketh, whom Campbell recalls as a braggart British millionaire. Hesketh did, however, found Hesketh racing and Hesketh Motorcycles. Campbell’s extensive body of work, however, is hardly confined to images of people on two wheels. She often compassionately depicts people on society’s fringe, including counter-culture strippers and prostitutes. She was also depicting transgendered people before the term was coined. One of her intriguing subjects included the 1980 murder of Stella Walsh, the controversial intersex Olympic athlete. A 1947 graduate of the Cleveland Institute of Art and a 1986 Cleveland Arts Prize recipient, Campbell’s work has been exhibited at major museums across the country. 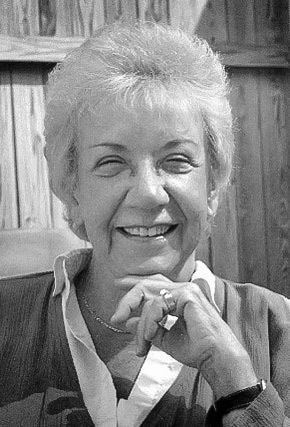 She also spent years teaching at Tri-C's Western Campus. Her work is in the collections of the Cleveland Museum of Art, the Butler Institute of American Art and Case Western Reserve University, as well as private collections throughout the United States. "The Motorcyclists of the Seventies,” however, has been the most comprehensive project of her career. The 92-year-old still paints everyday in her apartment at an assisted living facility. She also teaches painting to the other residents.